School science fairs can be horribly dull, with the same experiments appearing before the judges year after year. When you've seen one clay volcano belching red goo, you've seen them all. Students can give their chances of winning by doing something a little different. This year, try doing an experiment involving bubble gum. Many people react to a sugarless food before they even taste it, assuming they will hate it. This applies to sugarless bubble gum as well. Conduct a blind taste test in which you have students or other volunteers chew various pieces of bubble gum, both sugar and sugarless, and have them rate them on a scale of one to five. To ensure they do not know what they are getting, remove the gum from the packaging and pace in on a plate with a number under each piece. Provide glasses of water so the testers can rinse their palates between pieces. A variation on the previous experiment is to test the claims of some companies that their gum has long-lasting flavor. Select a range of bubble gums, including those that make this claim and those who don't, and have a group of volunteers test them. Instruct them to chew the gum until it loses its flavor, then slip it into a tissue. Have a clock handy so you can write down the point at which each type hits the tissue. In this experiment, you can test various ideas for removing sticky gum from clothing or other items, like walls or desks. Gum is notoriously difficult to remove. There are a number of products that claim to help people remove stuck on gum. You should test some of these, comparing them to some of the many household items that people claim will help you remove gum. In addition to conducting the tests themselves, you can explain to the judges the standards you will use to judge if something is "clean." An entertaining and messy experiment you can do relates to the bubble-making abilities of different brands of bubble gum. 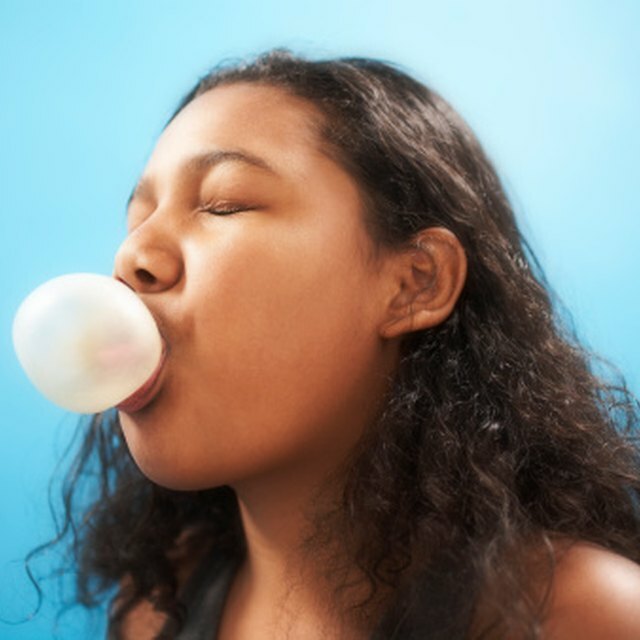 For this experiment, you will need volunteers to blow bubbles with several brands of gum. You will need to test each type several times to get a large enough sample to draw conclusions. To measure the size of the bubbles blown, you will need a large pair of measuring calipers. Ketchum, Daniel. "Science Experiments With Bubble Gum." Sciencing, https://sciencing.com/science-experiments-bubble-gum-12092249.html. 25 April 2017.